A robot from the Bay Shore “Mechanical Marauders” FIRST Team #271 shoots a disc into the goal during one of the rounds of the second annual Half Hollow Hills Invitational on November 16. On November 16, high school robotics teams met at Half Hollow Hills High School West for the Half Hollow Hills Invitational, a post-season robotics competition, sponsored by School-Business Partnerships of Long Island, Inc. The competition was designed to showcase the benefits of robotics programs on students, schools and their communities. Residents, teachers and administrators from the Half Hollow Hills School District and other Long Island school districts showed support for SBPLI and the robotics competition by attending the event. Twenty-seven teams competed this year: Baldwin, Bay Shore, Brentwood, Central Islip, Center Moriches, Cold Spring Harbor, Comsewogue, Connetquot, Great Neck South, Hauppauge, Half Hollow Hills, Hicksville, Island Trees, Lindenhurst, Long Island City, Malverne, Miller Place, North Shore, Patchogue-Medford, Pierson, Plainview-Old Bethpage, Port Washington, Sachem North, Seaford, and West Islip, with Huntington and Northport participating as pre-rookie teams. The finalists of the competition were FIRST (For Inspiration and Recognition of Science and Technology) Team #533, “PSIcotics” from Lindenhurst; FIRST Team #271, “Mechanical Marauders” from Bay Shore; and FIRST Team #2875, “Cyberhawks” from Cold Spring Harbor. The winners were FIRST Team #871, “Robotechs” from West Islip; FIRST Team #329 “Raiders” from Patchogue-Medford; and FIRST Team #3137, “T-Birds” from Connetquot. Participating teams used the robots they built for the 2013 Long Island Regional FIRST (For Inspiration and Recognition of Science and Technology) competition, which was held at Hofstra University in April. During the competition, students had their robots, some weighing as much as 120 pounds, compete on a 27-by-54-foot playing field with bridges, attempting to earn points by shooting as many discs into the goals as possible. 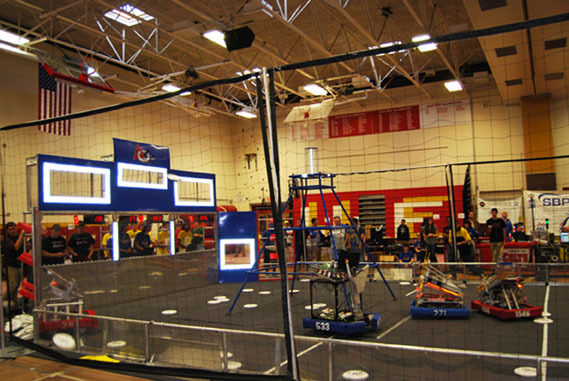 Matches ended with robots attempting to climb up pyramids located near the middle of the field.